The grammar book allows exceptions for historical nouns, so the examples in the answer to the above-linked question would pass muster. However, I’m sure that I learnt at school (which, admittedly, was a while ago) that for a singular (proper) noun ending in ‑s, the apostrophe went after the s and there was no additional s.
So my question is when did James’s become the correct form and James’ the incorrect one? 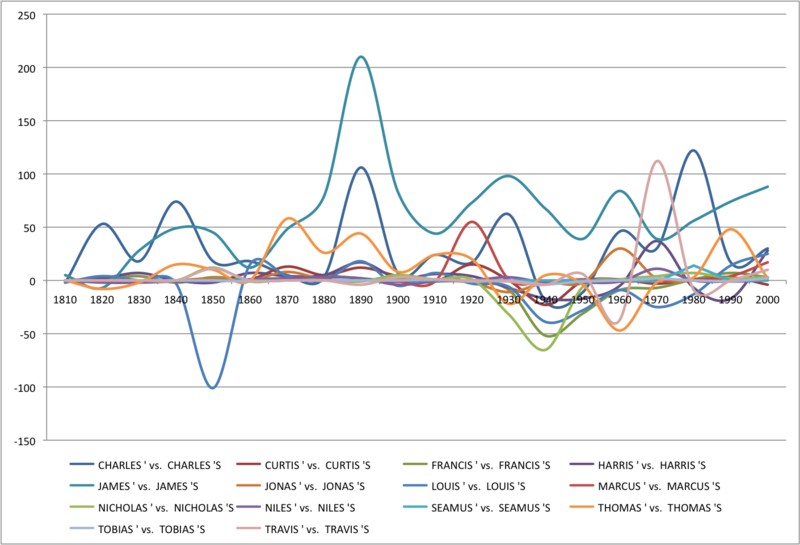 Since, 1810, forms like James’s (which I will call type A) have generally been more commonly used than forms like James’ (type B), according to my research using the Corpus of Historical American English (COHA).
. The y-axis shows the difference in incidence between types A and B. If it is above 0, that means that type A was more common in that period; if below 0, that means type B was more common. The raw data used to generate the chart is in this Google Spreadsheet. For the 14 names tested, type A has been more common throughout the period beginning in 1810, except for the decades starting in 1850, 1940, and 1950. Overall, it is quite clear that type A forms (e.g. James’s) predominate, and have done so for nearly two hundred years. Nevertheless, type B forms are also quite common, and during the 1930s to the 1960s, a number of names had more incidences using type B. But since 1970, most names have had a majority of usage in type A. 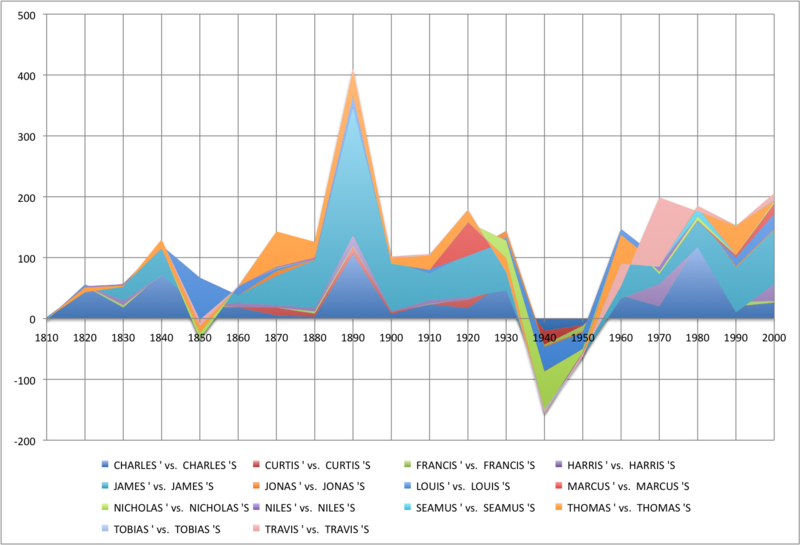 As for the original question’s example of James, throughout almost the entire period, excluding 1820, incidences of James’s has strongly outnumbered incidences of James’. I can’t speak to when, but I can say that Strunk and White’s Elements of Style specifically says to use the James’s form. Since that is taken as gospel by — who knows, hundreds, thousands, millions? — of writers, I’m sure it has an effect on modern trends. My recollection from school (UK, 1980s) is that the apostrophe-only version is used for Biblical names, and the apostrophe-plus-s is used for everything else. According to this rule, you would write "Jesus' friends and Seamus's friends" because the name Jesus appears in the Bible but the name Seamus does not. For all SINGULAR nouns (other than some Bible names), add the apostrophe S, regardless of the ending letter. For PLURAL nouns that end in S, add only the aposrophe. Somewhere along the way, I recall a tip (likely designed to simplify matters rather than clarify them) that stated that single consonant names ending in S such as James would be adjusted to James's to indicated the possessive, whereas a polysyllabic name such as Oedipus would simply get the apostrophe as in Oedipus'. Perhaps this is more of an aesthetic tip, but I like it. Clearly, the rules (if they can be called rules) change over time. Therefore, you will be able to see the popular Christmas carol lyric '"Sire he lives a good league hence,/By St Agnes' fountain"'. The metre does not allow for "Agnes's" in order to scan. Not the answer you're looking for? Browse other questions tagged orthography history possessives apostrophe proper-nouns or ask your own question. Adding “’s” when the name ends with “s”?